Whether you're an absolute beginner or an intermediate clarinet player, or if you're just researching about the best clarinet brands, I'll address everything in this buying guide. I'll cover the key things to keep in mind before picking a suitable clarinet. The clarinet is an essential part of the woodwind section of a symphony orchestra. Also, it is frequently used in marching and military bands, and most school bands have a clarinet section. Outside the classical and marching band circles, the clarinet also has a prominent role in klezmer and jazz styles. The B-Flat soprano clarinet is the standard today, though soprano clarinets in A are also used to a great extent. The clarinet family, however, includes a wide range of instruments of different sizes and tunings. Whether you’re just starting out or trying to get back in shape, check out some of my favorite student and intermediate soprano clarinets. 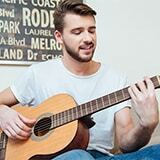 Beginner instruments often face a difficult challenge - they need to sound good at an affordable price. While some of them trade one for the other, the Eastar ECL-300 succeeds on both fronts. It is a student-class clarinet with great tone and a low price tag. This model also features a classic design and an exceptional set of accessories. 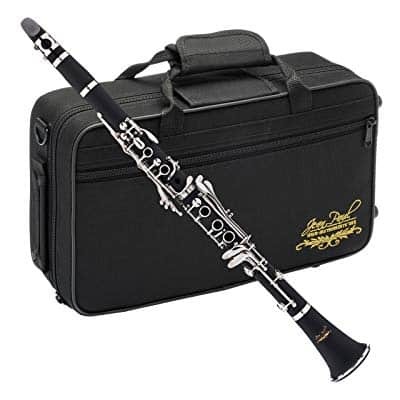 The ECL-300 is a B-flat clarinet that comes with an ABS Bakelite body and a bell-shaped mouth. The quality Bakelite construction grants this starter clarinet a bright, strong tone with good projection. That being said, you can get a slightly warmer sound out of it if you swap out the mouthpiece. The clarinet is equipped with the standard 17-key Boehm system with nickel-plated keys. The keys feature Italian felt pads which provide a good level of elasticity and airtightness. The high-carbon steel needle spring and dual 62MM and 65MM mouthpiece connectors make this affordable clarinet easy to tune. The ECL-300 is packed with a wide range of accessories and maintenance tools. They include two mouthpiece connectors, 4C mouthpiece, eight occlusion rims, metal ligature, two thumb sheets, a small tripod stand, clarinet swab, pair of 2.5” practice reeds, pair of 2.5” black resin reeds, white gloves, and joint grease. A simple hard-shell case is included, too. Whether you are playing in a school band, attending a music school, or learning on your own, you will need a trusty instrument. 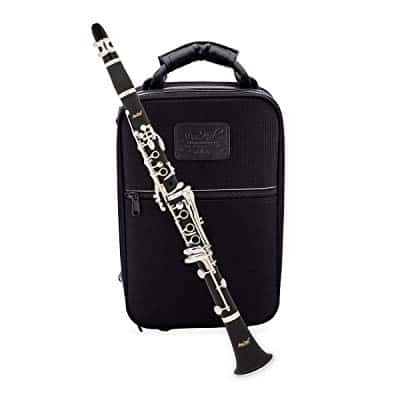 The well-built Jean Paul USA CL-300 is a sturdy and resilient clarinet. This beginner clarinet sits on the cusp of the lower intermediate class, offering the best of both worlds. It is highly recommended for students who are looking for a reliable instrument. The CL-300 clarinet by Jean Paul USA comes with an ebonite body, instead of the prevalent Bakelite. This gives it a slightly different tone. The black clarinet is clad in nickel-plated hardware. The bell at the bottom ends in a beautiful ring and features the company logo. This clarinet, like most student-class models, sports the standard Boehm 17-key system and is tuned to the key of B-flat. It also features a simple ligature and mouthpiece. Thanks to the steel needle spring, it is easy to tune and holds the tuning quite well. The package also includes a mouthpiece, cap, professional-grade Rico reeds, neck strap, and cork grease. Everything is neatly packed in a sturdy carrying case. Ebonite has been used in clarinet production since the mid-19th century. Today, only a small percentage of clarinets, mostly those in the student class, are made of ebonite. The Mendini by Cecilio B-Flat Clarinet is among them. 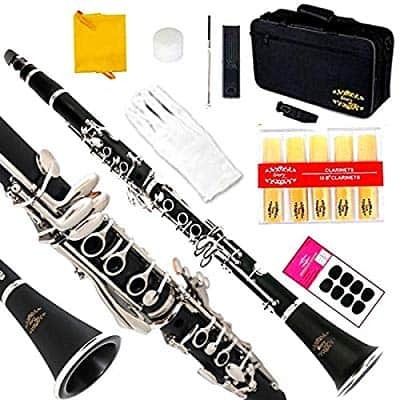 This entry-level clarinet is a great option for kids in school and marching bands, as well as adults interested in taking up this beautiful instrument. The Mendini B-flat clarinet starts off with a standard-sized five-piece ebonite body. Mendini offers this clarinet in a range of colors for the body. Apart from the standard black, the palette includes green, purple, blue, red, pink, sky blue, white, and yellow. A solid rosewood variant is also available, though it is significantly more expensive. All of them feature the same nickel-plated hardware. This B-flat clarinet sports the standard Boehm system with 17 keys, making it great for novice players to quickly learn the ropes. The playability and tone quality are on a commendable level, considering this is an entry-level model. The standard ligature is used on this model. 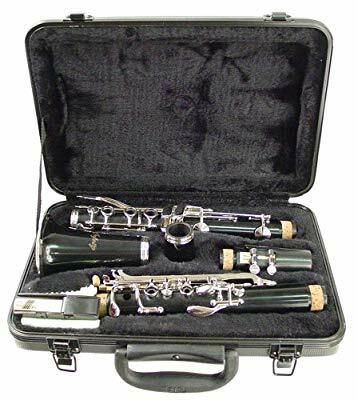 The package also includes a padded case with a shoulder strap, two barrels, cap, mouthpiece, cork grease, 10 reeds, cleaning cloth, and gloves. While considered an entry-level Yamaha, the YCL-255 is more of an intermediate-level instrument. It costs quite a bit more than your average beginner clarinet, though it also delivers better tone and build quality. The 255 clarinet is aimed at students and professional musicians alike. The YCL-255 made its debut in 2012, replacing the YCL-250 which was Yamaha’s main student clarinet for well over a decade. Yamaha played it safe with the design and construction of the 255 model and kept it largely similar to its predecessor. The main differences include the omission of the bell ring and the addition of a thumb rest with a loop. The YCL-255 has a standard-sized five-piece body that is made of ABS resin and combined with nickel-plated silver hardware. This model comes with the popular Japanese-made 4C mouthpiece and a 65mm barrel. The standard 17-piece Boehm key system is also there, as are the Valentino key pads. The package also includes a carrying case, cork grease, swab, cleaning cloth, reed, and instruction manual. 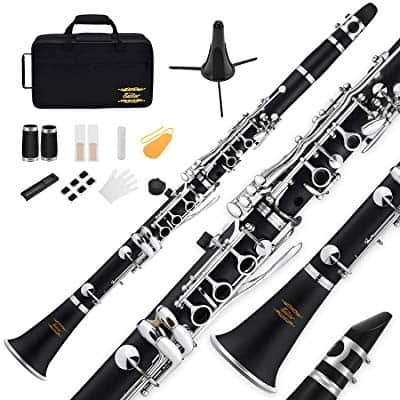 The Hisonic Signature Series 2610 is a standard B-flat soprano clarinet for beginners and experienced players coming back from a long-time hiatus. The clarinet offers decent, though not impeccable build quality, which is to be expected at its price point. Also, the 2610 sports an elegant classic design that will perfectly blend in with the rest of a band or orchestra. The 2610 clarinet starts off with an ebonite body and a set of nickel-silver keys. The body is a standard five-piece and the bell at the bottom is capped by a metal ring. The lower and the upper joints are equipped with the regular Boehm 17-key set with US-made Prestini pads. In the sound department, the Hisonic Signature Series 2610 offers a bright tone with good projection, characteristic of ebonite clarinets. While nothing to be excited about, it is a good-sounding clarinet overall with good playability and tone for the money. The cork grease, mouthpiece with reed protector, and swab are included. The clarinet and accessories arrive packed in a neat carrying case with plush lining on the inside. While starting out on a super-affordable instrument is okay, some novice players prefer to skip that step and invest a bit more in their first instrument. Quite a bit more expensive than the CL-300 under it, the CL-400 is marketed as an intermediate/advanced model. It is also a good option for players who have mastered the basics and want to move up from the super-affordable class. 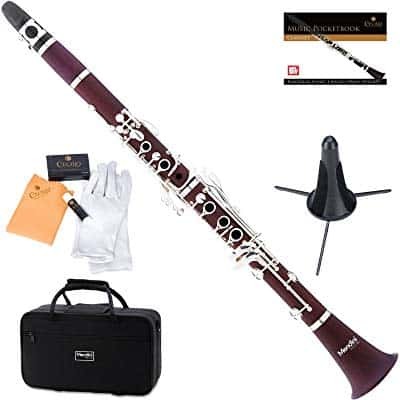 The CL-400 is a B-flat soprano clarinet with ABS body and silver-plated keys. The keys are laid out in the standard Boehm pattern, making the transition from a beginner model a breeze. The mouthpiece on this model is made by Bari and the ligature by Rico. The sturdy carrying case that comes included provides ample protection. Its outer shell is water-resistant and equipped with sturdy handles. Along with the case, Jean Paul USA also includes a cap, cork grease, and the previously mentioned Rico ligature and Bari reeds. Intermediate-class clarinets are not just learning tools, as they can also be used for performing and, in some cases, recording. Usually, they feature better craftsmanship, classier looks, and overall better tone and playability than their entry-level counterparts. The Mendini MCT-30 is marketed as an intermediate clarinet that offers a balanced mix of features. The MCT-30 is the solid wood version of the Mendini B-flat student clarinet. Its gorgeous rosewood body did away with the metal ring at the bottom of the bell. The lacquered wood is beautifully contrasted with the silver-plated keys, lost in all of that is the black mouthpiece. Owing to the solid wood construction, the MCT-30 has a great tone, comparable to the more advanced and expensive models. Playability is pretty average, on the same level as the B-flat student model with which it shares hardware. Like all Mendini instruments, the MCT-30 really shines in the accessories segment. 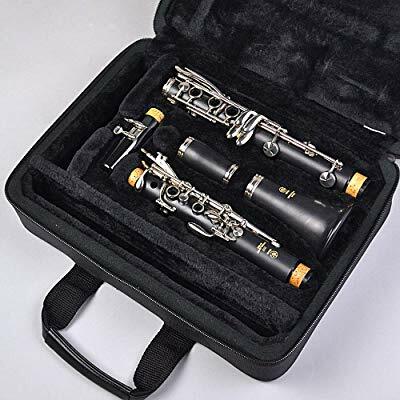 The clarinet comes in a sturdy padded carrying case. You will find in it a set of 10 reeds, cleaning cloth, white gloves, instruction manual, cork grease, foldable clarinet stand, and mouthpiece. In my opinion, if you are just starting out, your safest bet is to get a super-affordable instrument. When you progress beyond the basics, you can easily upgrade to a more advanced instrument. 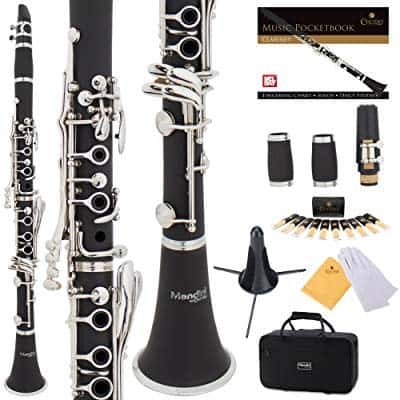 The Glory B Flat Clarinet is an entry-level soprano model made with complete beginners in mind, which is why it comes with everything a novice will need to start their musical journey. The Glory B Flat Clarinet starts off with a soprano-sized ebonite body and nickel-plated keys. The keys are laid out in the standard Boehm 17-key pattern, featuring inline trill keys. Though of decent quality, the hardware on this model can’t compare to more expensive options. In terms of tone quality, this B-flat student model is roughly comparable to other entry-level models. The tone is bright and has a decent projection. Combined with average playability, it makes the B Flat clarinet a sound choice for learning the basics. The package also features a carrying case with a shoulder strap, set of 10 spare reeds, 8 cushion pads, white gloves, cleaning cloth, screwdriver, reeds holder, cork grease, spare barrel, and cap. 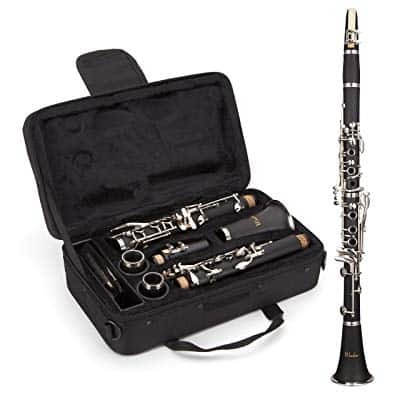 The Windsor MI-1003 is an entry-level clarinet made primarily for beginners and players looking to get back in shape. Also, intermediate and advanced players who want an affordable practice instrument might find good value in this model. The MI-1003 offers a simple design and construction, combining satin black body and nickel-plated hardware. Similar to many entry-level models, the body is made of Bakelite. The keys and ligature are of decent quality, giving this clarinet good playability. However, due to an extremely tight fit, the parts are very hard to assemble and disassemble. In the sound department, the MI-1003 has a bold and bright tone and the projection is good for its price class. While okay for practicing at home and taking lessons, this clarinet is not the best choice for performing and recording duties. The MI-1003 comes disassembled in a padded carrying case. The accessories include cork grease, cleaning kit, spare reeds, and mouthpiece cover. Though the B-flat and A soprano clarinets are the standard, there is a wide range of sizes and tunings beyond the two. Other types include the piccolo clarinet, basset horn, basset clarinet, alto clarinet, contra-alto clarinet, bass clarinet, and contrabass clarinet. However, the common alternatives to the ubiquitous B-flat/A soprano duo include the B-flat bass, E-flat alto, E-flat soprano, C sopranino, and A-flat sopranino varieties. The standard soprano clarinet is made up of five pieces with the mouthpiece at the top. It is the part through which a clarinetist blows air to create sound. The most basic ones, found on student models, feature a mouthpiece cap and ligature. Mouthpieces on affordable models are usually made of plastic, while the more expensive models might have ebonite mouthpieces. The ligature is there to keep the reeds in place and its design and quality have a great effect on the overall tone. It is usually made of metal, though other materials are available as well. Beginner models tend to have very simple ligatures with simple fastening systems. The barrel is located between the mouthpiece and the body, and it plays a significant role in the clarinet’s tone and pitch. It can be made of a wide variety of materials, though student models commonly have ebonite barrels. It is not unusual for even the budget models to have interchangeable barrels. While not that common among students and beginners, intermediate and advanced players might use several different barrels, depending on the occasion and the repertoire. The body of the clarinet is made up of two parts – upper joint and lower joint. The two hold the instrument’s keys and holes. Usually, a clarinetist plays the keys on the upper joint with the left hand and those on the lower joint with the right hand. Some smaller models may have a one-piece body. The vast majority of modern clarinets have seven tone holes on the body – six in the front and one in the back. These are covered and opened by fingertips and can produce all the notes on the chromatic scale. The bottom part of the clarinet is called the bell due to its bell shape. The bell is there to improve the uniformity of the tone, rather than amplify it. In soprano clarinets, it is made of the same material as the rest of the body, while the bigger clarinets have metal bells which curve up and out. There are two main materials used for clarinet bodies – plastic and wood. ABS, Bakelite, and ebonite (a type of vulcanized rubber) are the most common plastics. 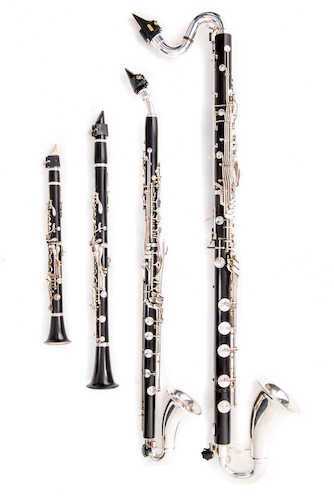 Key advantages of plastic clarinets are low maintenance and the ability to withstand humidity and temperature changes. As for wood, granadilla (a.k.a. African blackwood) is the dominant species, but there are also other woods used. Wood is almost exclusively reserved for intermediate and advanced clarinets and is rarely seen on student models. Wooden clarinets offer superior tone but need a lot of care and maintenance. The keys on a standard soprano saxophone are usually laid out in the Boehm pattern. The pattern was created by Hyacinthe Klosé and named in honor of Theobald Boehm, the great flute designer. Alternative key layouts include Oehler and Albert systems. While the Boehm design is universally used, Oehler is popular in Austria and Germany. The Albert system is also popular with klezmer and jazz musicians. Clarinet keys are made of metal, most commonly nickel/brass alloys. They are usually plated in nickel or silver. Some expensive models might have gold-plated keys. From a symphony orchestra to a marching band, to a klezmer and jazz band, the clarinet is an integral and important member of the ensemble. While it plays a less prominent role in big settings, clarinets shine in small bands where their gentle and emotional tone can be properly highlighted. If you’re starting your own jazz or klezmer outfit or joining a marching band, a good and affordable clarinet might be the best choice. While not exhaustive, this list might give you a good idea about where to start your search.